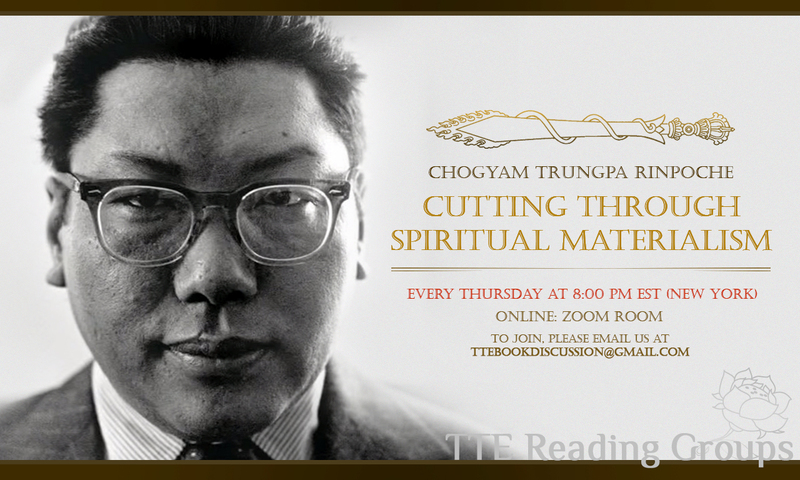 In this weekly online Reading Group we are discussing Chogyam Trungpa Rinpoche’s book Cutting Through Spiritual Materialism. This group is open to everyone, and we are especially looking forward to welcoming all Tara’s Triple Excellence participants around the world to join us, no matter in which part of the program you currently are. This will not be a teaching situation, rather it will be a peer-group discussion with no requirements for joining other than reading the assigned chapters. A moderator will see that the class moves smoothly, ensuring that everyone gets a chance to share and that no one person dominates the discussion. We will meet online every Thursday at 8:00pm EDT (New York time), using Zoom video conferencing software (https://zoom.us/download). If you are interested in joining this weekly Reading Group, please let us know by contacting: George Woodard at: ttebookdiscussion@gmail.com.